Does the garage door have a high durability rating? Is it available in a color that blends nicely with the façade of your house? Does the garage door complement the architectural style of your home and its exterior decorative elements like the front door, window shutters, etc.? What energy efficiency features does it have including insulation? Are there any special safety features included? Does the overhead garage door have a safety rating? Is the garage door available with customizable options such as your choice of hardware or glass allowing you to have your own unique appearance? Also, take some time to check with garage door manufactures. Some offer a design tool by which you can upload a photo of your home and experiment or “try on” all the different garage door options including color and style, making it easy to select the right overhead garage door for your new house. If you are building a new house, chances are you’ve thought about every detail from siding and brick to carpeting and light fixtures making sure that all the elements of your new home reflect your personal tastes and lifestyle. 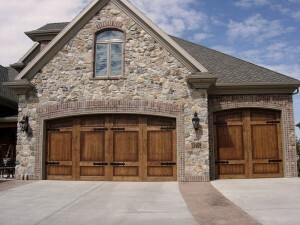 But, have you thought about how the perfect style garage door will complement your home and lend further curb appeal? Just like window shutters and porch columns, garage doors add character to your home and contribute to the overall exterior appearance. 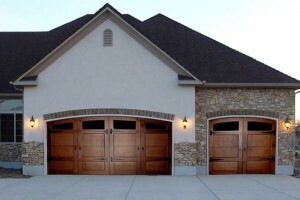 So take some time to consider what type of garage door(s) will complement your home best. Overhead garage doors come in a fabulous array of sizes, styles and colors ensuring you’ll find the just the right one to give your home a stylish look. They are can be made from several different materials including fiberglass, steel, vinyl and wood and are available with or without windows. You’ll find a wide variety of styles to choose from such as estate, carriage and traditional style doors at most home improvement stores and some online retailers such as Precision Garage Doors St. Louis. With just the right garage door, your new home is sure to catch the attention of any passer-by.